Orange Chili Grilled Chicken - seriously delicious! Only 4 ingredients! Chicken, sweet chili sauce, honey and orange juice. Grill and baste with reserved sauce. SO much great flavor!!! We always double the recipe for leftovers - great on a salad or in a wrap. 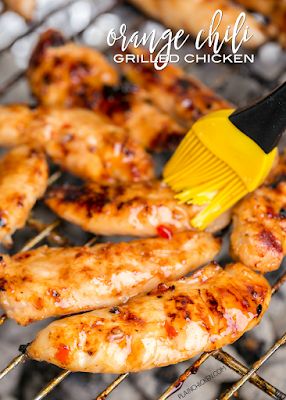 We LOVE this easy chicken marinade recipe!!! Grilling season is in full swing at our house. We had a super mild winter this year, so we have actually never stopped grilling! This Orange Chili Grilled Chicken has become a fast favorite. It is super easy to make and has TONS of great flavor. We used this marinade with some chicken tenders, but it would also be great on chicken breasts and chicken thighs. This recipe uses sweet chili sauce. I used Frank's Chili Sauce. I found it near the hot sauce and BBQ sauce. The sweet chili sauce isn't spicy at all. It just gives the chicken a little hint of sweet and spicy. It complements the orange juice perfectly!! We've made this several times over the past month and really have enjoyed it every single time. I like to chop up the leftover chicken and put it on top of a salad or in a sandwich wrap. Whisk together chili sauce, honey and orange juice. Reserve 1/4 cup for basting. Pour remaining marinade over chicken. 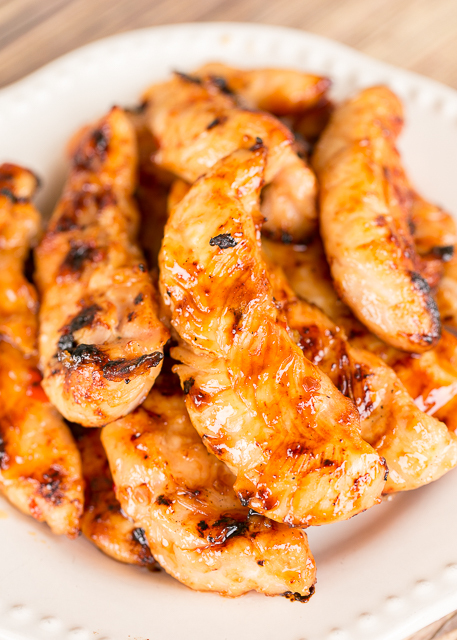 Marinate in the refrigerator at least 30 minutes up to a few hours.